Yeah, I know – most vegans are sick to death of salads. Sick. To. Death. I mean, it’s usually the bland, tasteless food that’s offered to us when we go out with non-vegan friends – hands up if you’ve heard this before: ‘we’re going to a steakhouse, but don’t worry, I’m sure they have salad.’ Ugh. But the truth is, salads are bey. Salads are life. 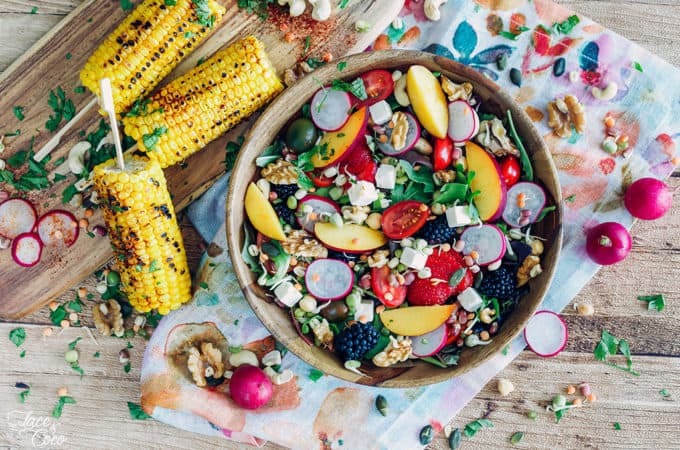 Gone are the days when salads were wilted, sorrowful bowls of blah – thanks to some creative vegan chefs, today salads are creative meals of plant-based goodness that leave us both refueled and happy. Yes, happy! If you’re still seeing your salads as a basic bed of greens, you’re about to see just how fun, complex and delicious salads can be – you’ll be looking forward to eating salad from now on! Whether you want a big blend of tastes and textures, or a simple, tasty meal smothered with a zingy dressing, we’ve found recipes for 30+ vegan salad recipes that are far, far, FAR from boring. Salad for breakfast? Why the hell not? 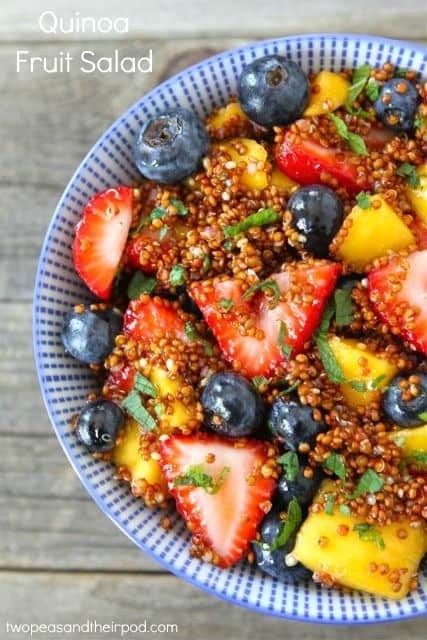 This summery one features mango, berries, grains and a wonderfully zingy honey/lime/mint dressing, guaranteed to help you start the day off right! 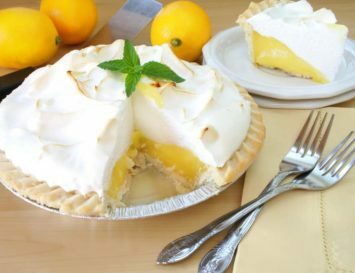 This is such a versatile recipe! It’s great as a light breakfast, as part of a brunch, a dessert, or could even be something you serve between courses at a big dinner to cleanse the palette. Personally, I’d serve this one for dessert with a scoop of banana ‘nicecream’. Oh wow! This salad is just packed full of vibrant colour thanks to all the juicy, delicious fruits and veggies. It’s a sweet and savoury mix with sprouts, sweet berries, ripened tomatoes and creamy avocado. This recipe calls for vegan feta, but if you can’t find any, why not try and make your own? Yeah, this one also features corn, but you know what? I love it – the sweetness, the crunch, the carbs (as long as it’s not GMO corn! No, no, no!) If you feel the same, then this recipe is right up your street. 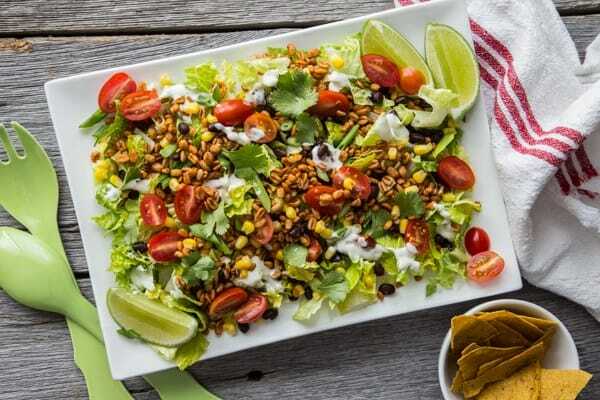 Be sure to have all the salad prepped and ready to go so that as soon as your corn is cooked you can throw it all together. Trust me, it’ll taste that much better. And it’s all finished off with a creamy lime dressing. Viva Mexico! Why eat your salad in a bowl when you can eat it from an edible tortilla bowl?! Lentils make a perfect meat-sub and they’re spiced and mixed with walnuts to create the heartiest part of this dish. It’s then served over greens with these crispy tortilla bowls. The avocado dressing is the pièce de resistance! If you’re not one for throwing fruit into your salad bowls, please just try to start off with some mango – you’ll love it. It goes so well with the spiciness of the chilli and the sweetness of the sultanas! Pumpkin seeds give this salad wonderful texture not to mention a healthy boost of protein. Plus the quinoa will sustain you for longer, thanks to even more protein. I love throwing tofu or falafels onto my salad. It not only bulks them out but it feels like you’re really eating a delicious and nourishing meal. Ain’t nobody got time for diet salads! Oh no. Here, in place of falafel, we have some nice, filling bean and seed balls, simply made from canned white beans, sunflower seeds and then seasoned with a mix of paprika, thyme, salt and a clove of garlic. The outcome? Salad perfection. I mean, for real, if you can eat your salad like it’s a bouquet of flowers, why not, huh?! The tortilla wraps are stuffed with a vegan ‘chicken’ salad made from chickpeas. It’s then topped with an edible bunch of radish flowers and honestly, the presentation of this deserves an award of some kind. Men – take note; imagine the smile on your woman’s face if you made her this for lunch . . .
Before going vegan I used to be a huge lover of a chicken Caesar salad, mainly due to the the crisp lettuce and the tangy dressing. 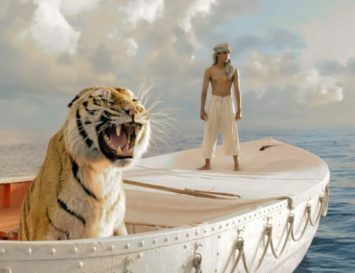 What I didn’t like so much? The hidden fish inside of the sauce – and now, of course the idea of chicken is just gross! So I am so happy that I can now enjoy my go-to salad in a much healthier and vegan friendly fashion. This is what I shall be eating for the whole week. And maybe the next, too. I know it sounds weird, but you HAVE to go make this. 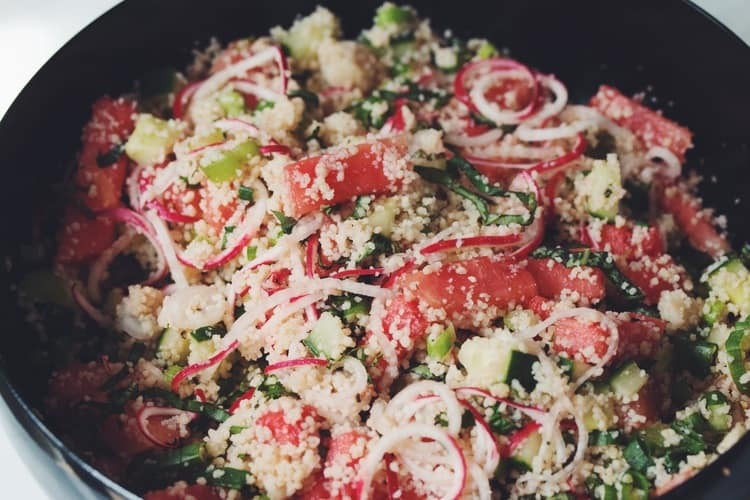 The watermelon is so juicy and works so well against the fluffy couscous and the crisp radish and onion. I don’t know why fruit in salads works so well; it just does. Let us not question it. Let us all just re-create this recipe is sigh in peaceful salad harmony. If you’ve never roasted cauliflower before then you should try it ASAP. It gains an almost meaty texture so it really steals the show if you throw it into a salad. The Cajun spices add a real depth of flavour, whilst the tahini makes a fuss-free, nutritious dressing. 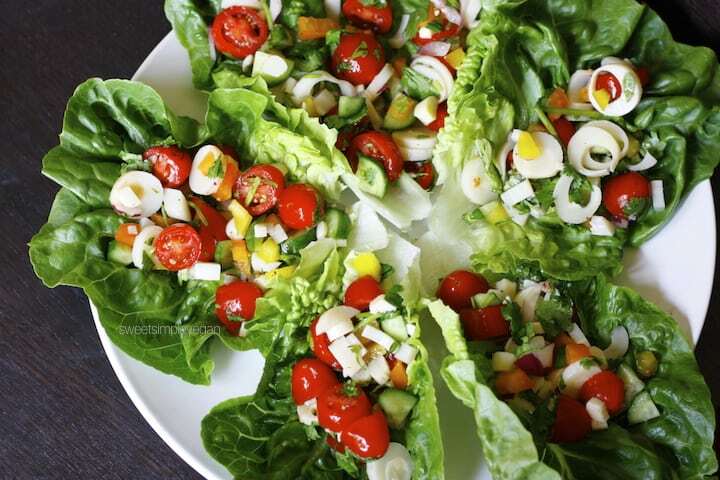 If you want a quick and easy salad recipe loaded with goodness, then this is one for you. It’s brimming with goodies, from the chickpeas and quinoa, lending plant-based protein, to the healthy fats from the pumpkin, sesame and hemp seeds. It all mixes together in a bed of kale, and is finished with a orange soy and sesame dressing. 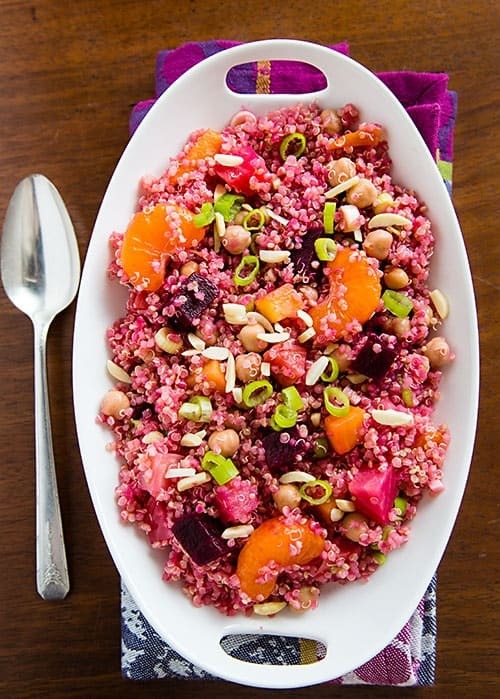 To save more time you could use this couscous instead of quinoa. Before going vegan I would typically eat chicken with my salad for something filling, but when I went vegan I thought, ‘What the heck will I eat now?’ Um, duh! Chicken salad, still! It’s super easy to make mock chicken if you’re missing meat, but not wanting to revert back to your carnivore ways. It all comes together in a creamy vegan mayo dressing. Something you just gotta make a salad that is more about comfort than nutrition. Why not bring the vibe of a summer BBQ to your salad? This hearty salad will well and truly fill you up without leaving you feeling heavy and sluggish. The roasted cauliflower slathered in barbecue sauce is enough to make anyone give up meat – yep, it’s that good. Plus it’s then topped with corn, tomatoes and crispy baked onion rings. Have I died and gone to good heaven? Cos it sure well feels like it when I eat this one. I used to buy a salad not all too dissimilar to this in a resto and it would cost me just short of ten pounds. Daylight. Robbery. 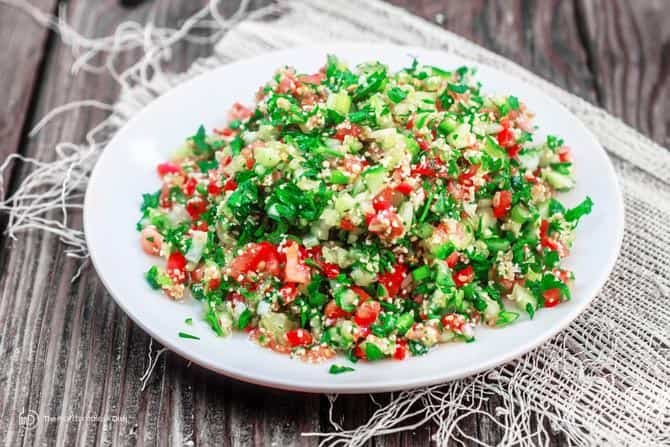 Now you don’t have to rely on pretentious health bars to get your superfood salad – you can make it from your very own kitchen. Sometimes I just crave a really healthy, green salad and this ticks all the boxes. Packed with lots of different shades and texture, it won’t even feel like you’re eating rabbit food. If you’re not a huge fan of beetroot then you need to try roasting them yourself to unleash their sweetness and kill that ‘earthy’ taste. After mixing them with a sweet fruits, like ripe orange slices, and something tangy, like vinegar, and the beets will taste super sweet and delicious. Plus, how fantastic is the colour of this dish?! Purple on fleeek. If you’ve never added vinegar to fruit, you’ll be pleasantly surprised by the explosion of flavour in this salad. The tanginess of the balsamic mingles perfectly with the sweet, ripened fruit, crisp lettuce and quinoa. 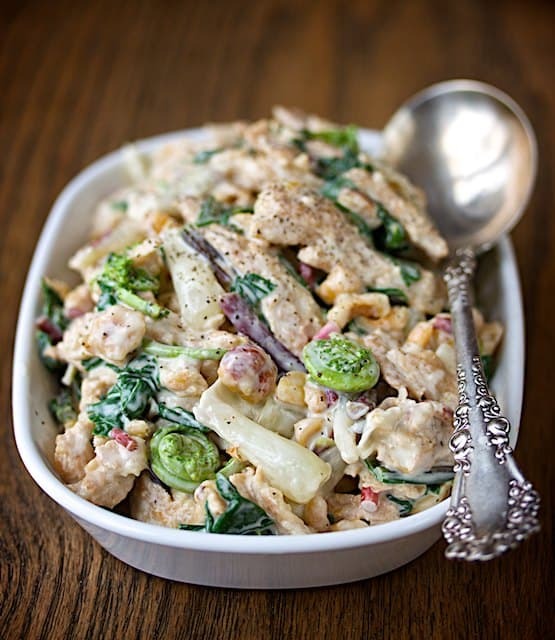 It’s a real sweet vs savory salad, so it will satiate your cravings for both at the same time. I live for tacos, so a deconstructed taco salad? Count. Me. In. Farro is used to make the ‘meat’ in this recipe, and it’s added to fire-roasted corn, black beans and tortilla chips. The best part in my humble opinion? 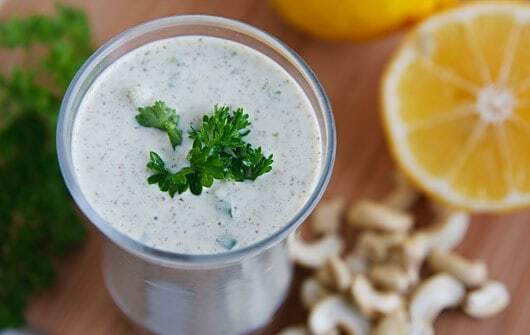 The creamy lime dressing. Take the time to make it, seriously, you will never regret it. You’ve probably tried and loved buffalo cauliflower by now. So why not try making buffalo tempeh bites?! They’re firmer than the cauliflower so it makes a brilliant meat substitute, as it has the same texture to say, a chicken wing, but without the gross decaying animal flesh. 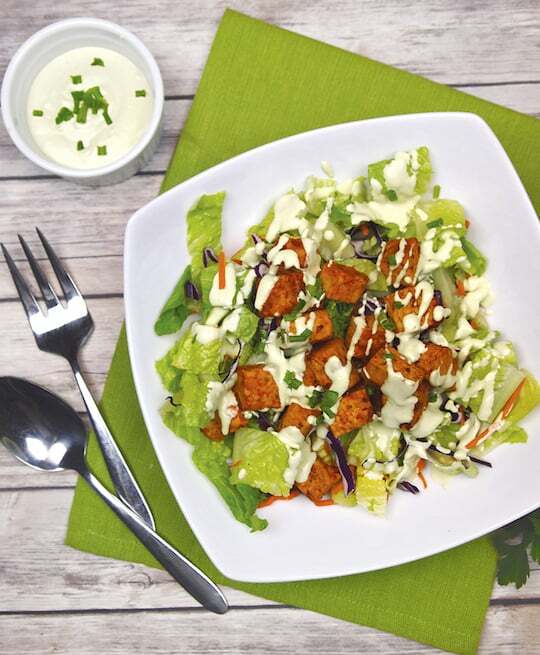 The cashew ranch dressing is the perfect refreshing coolness against the fiery spice of the marinated tempeh. I don’t know why, but the combination of bitter arugula, sweet peaches and tart balsamic vinegar is such a heavenly combination, I could dine on it well into the foreseeable future. 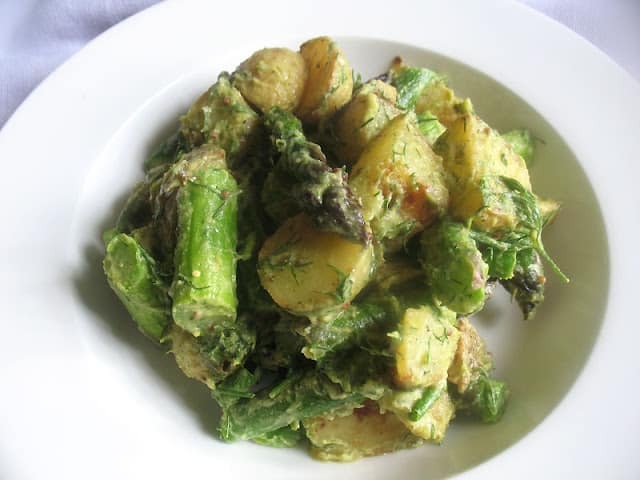 This is such a quick and easy salad to prepare, you could whip it up in seconds. Make a batch of grains at the beginning of the week and dine on this during the week for a light, refreshing and yet incredibly hearty salad. Sometimes, you just have to eat the rainbow. This is a real superfood boost, from the mixture of kale, broccoli, beets, carrot and ripe avocado and blueberries, to the mix of nuts and seeds. A tangy blueberry and ginger dressing finishes this salad off. Seriously, you’re about to give your taste buds a real explosive treat – and isn’t this pretty, too? Carrots can be a bit on the bland side, so seasoning them with something like curry powder people lifts them up and brings them to life. The carrot slaw is met with nutty tahini, and then layered with sticky sweet and smoky maple glazed tempeh triangles. If you’re far from a cauliflower lover, you need to give this recipe a try. Cauliflower is so underrated! If you’ve previously had it streamed, try experimenting. Roast it, fry it, turn it into cauliflower rice. Your world is about to become revolutionized by the cauliflower! This salad is a testament to the wonders of cauliflower, and the ginger, peanut and lime dressing brings a touch of exotic Asia to the dish. The base of this salad is quite literally a mass of veggies. 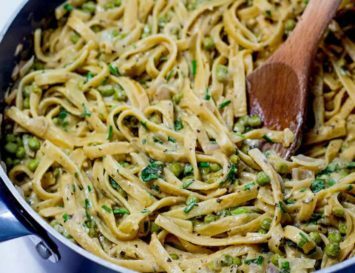 From red pepper, cabbage onions to carrot noodles, this recipe is the perfect way to use up any leftover veggies in your fridge. Then some brown rice vermicelli noodles are thrown in because #carbsarelife. Cilantro and mint add a little green power. Then comes the marinated peanut tempeh, and oh my word, this is what Thai foodie dreams are made of. This recipe is basically everything that is great about summer in one bowl. Crisp kale, juicy mango, fresh bell pepper with cilantro, lime and a peanut dressing. I mean, you could throw this all into a wrap, but eating it in a salad form is way more fun (and lower in calories, obvs). Asian flavours are wonderful, so when summer rolls round you need to use them in a salad, and this recipe is perfect. There’s lime, chilli, ginger, soy sauce, spring onions, lemongrass, coriander and mint that are all screaming to be eaten in this super yummy salad. My favourite part? The sticky smoked maple tofu topping. I absolutely love how turmeric turns everything it comes into contact with the most brilliant shade of yellow. The cauliflower chunks are roasted alongside the tempeh and tossed in a turmeric and miso dressing. Toasted walnuts, vegan shiitake bacon are then thrown into this salad, and the whole dish is then drizzled with a sweet and creamy maple-tahini salad dressing. Just like salads don’t have to be cold, warm food doesn’t have to be overly filling. 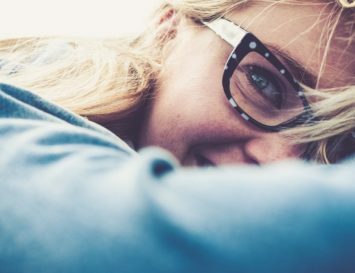 Sometimes we want to enjoy a lighter meal but one that still soothes our soul. Fragrant cumin seeds add a burst of Indian flavour in this dish. The lentils bulk it out a bit, and a huge spoonful of cashew cheese sets this off perfectly. Oh, what a great idea! I never would have thought of combining avocado, mango, quinoa, asparagus and edamame in a salad, but this is genius. The sweet ginger/lime/soy dressing is just the cherry on the proverbial cake. If a salad can be defined as a bunch of veggies in a sauce, then the Peruvian dish of ceviche is, technically, a salad. This one combines avocado with exotic hearts of palm, tomato and other veggies in a zingy dressing, all served up on a bed of lettuce. Love Peruvian food? Get more vegan recipes here! Sometimes you just want something super filling and tasty – something that reminds you of your childhood, too. And this salad is all that. Perfect for picnics, and tastes even better the second day – if you manage to have any leftovers, that is! Given the massive amounts of mayo and egg involved in making a potato salad, it seems unlikely you’ll be able to find a decent vegan version. Until now, that is! This one gets its creaminess from avocadoes and a bit of mustard. 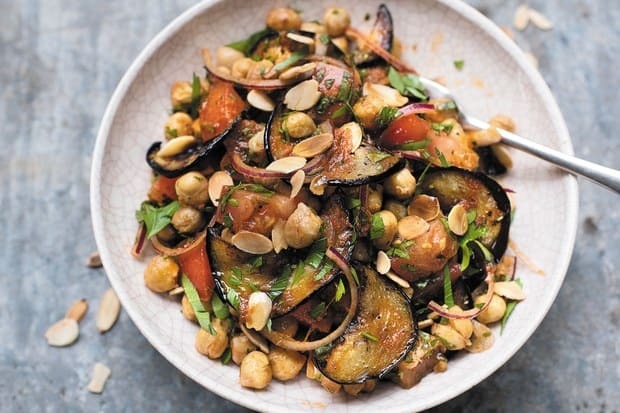 All the best tastes of the Middle East are in this salad: fried eggplant, olive oil, almonds and of course, chick peas, to name but a few. Drizzle some tahini on this, and you’ll never want to eat anything else! Also tastes great in a pita pocket. Did you know that herbs are sprayed with fewer herbicides than other veggies? Which means if you can’t afford or find organic, this parsley based salad is a perfect detox dish. Simple to make, too! Ok, this is it – the ultimate vegan salad! Sure, the components may not be all mixed up, but all the flavours and healthy ingredients are there – you’ve got your proteins, fibre, good fats and of course, your greens. You could add one of the dressing recipes below…or not! If you’ve never tried adding fruit to your salad before, do try it. 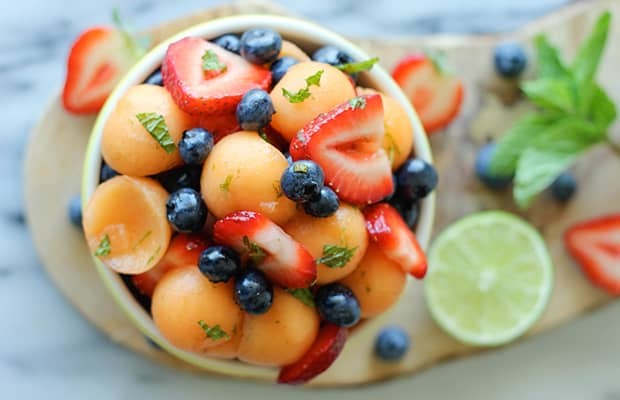 It works surprisingly well, and depending on what salad vibe you’re going for, fruit can really amp up the taste and texture of an otherwise dull salad. Add raisins and apricots to Middle Eastern style salads, or green mango to Asian ones. 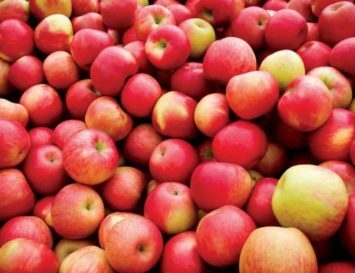 Apple’s a nice addition, especially with walnuts or a citrus based dressing. Basic raw veg is great, but why not try some roasted red peppers or some grilled zucchini to make your salads both delicious and playful? Don’t rely on store bought dressings – not only do they cost a pretty penny, but they usually contain sneaky sugars, preservatives and even hidden animal derived ingredients – gross. For a quick and easy salad dressing use a zesty fruit such as lemon or lime to add a quick and easy dressing over your salad. Sometimes I just use olive oil and balsamic vinegar – it’s incredibly rich and goes really well with leafy greens. Don’t be afraid to use herbs, too. Cilantro and basil pack a powerful flavour and can really boost a salad, but if you want something a bit richer and more complex, check out these recipes, below. There’s not much to this dressing: just four simple ingredients and then you can slather it all over your salad and rice bowls. The base is yellow mustard and water, and it’s then sweetened a little with maple syrup to dull the chili powder down every so slightly so that it doesn’t knock your socks off. Voila! Some of us don’t want lots of oil in our salad dressing, but that doesn’t mean it can’t still taste spectacular. This lemon and poppy seed based dressing is going to add the perfect zest of life to your bowl of greens. It’s bright, fresh and aromatic – and low in calories, too. This green dressing is made with, yep, you guessed it: lots of greens! 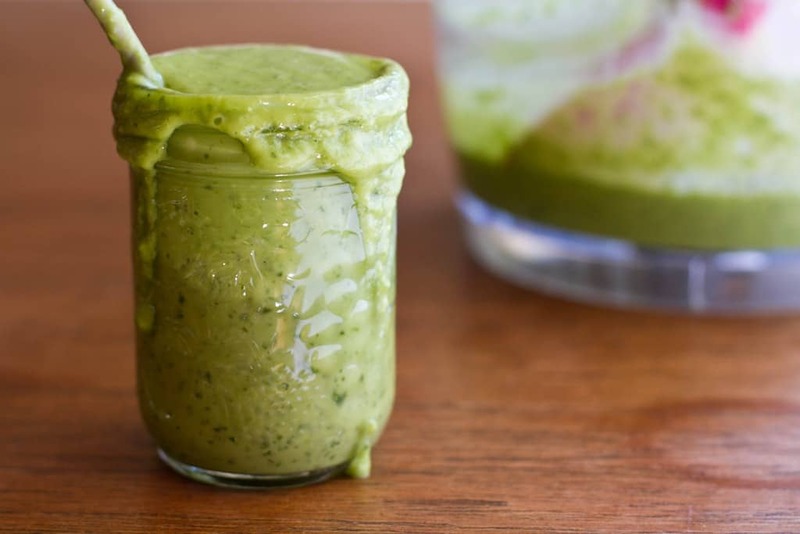 The herbs make this wonderful and fresh and has a wonderful detox vibe. The best part is that you can play around with the herbs to suit what you have on hand when making it. Use this over salads, but it would also make a great snack if you wanted to dip some crudites into it, or even use it as a pasta dressing. Perfect for summer! The base of this is raspberries and lime so it’s pretty tangy. But there’s some brown sugar to sweeten it up. Drizzle this over any salad to give it a lift of life. Plus, can we all gush over the colour of this dressing? I’m a huge fan of ranch dressing. It’s a little creamy, it’s a little zingy. It’s basically the best. But traditional ranch dressing has a whole heap of dairy in it such as mayonnaise, sour cream and buttermilk, whereas this wonderful creation is 100% vegan friendly. Plus the creamy texture in this dressing doesn’t rely on dairy – the answer is cashew nuts! Go live out your ranch dreams, guys. 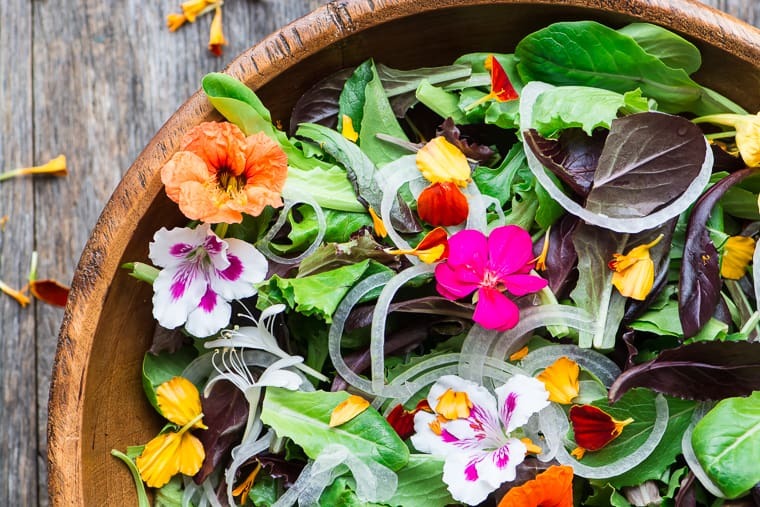 Main image: Green salad with edible flowers. Get the recipe here.